If you scamper along to the Perth Festival of Arts, you can catch body artist Latai Taumoepeau in a video of herself as a Tongan who’s drowning from the devastating seas of global warming. 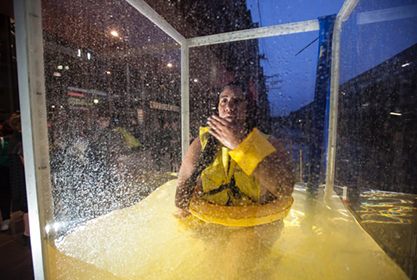 She dances inside a Perspex tank (pictured below), her movements becoming “more challenging and frenetic” as rising water finally submerges her. In that video Latai identifies as both a first-generation and a third-generation Australian. What’s definite is that she grew up in Marrickville, Sydney, as “a person of color” (ancestry Tongan) afflicted by open and covert racism that gave her a “sense of otherisation”. Her actor-musician friend Jay Laga-aia says, “She definitely is a voice that can’t be silenced.” Silenced? She’s had $27,000 direct from the Australia Council, plus indirect Australia Council help through its funding of events in which she stars. She is also an Australia Council peer assessor with a voice in deciding which of her fellow artists get funding and how much, as she explains in this video clip. When not pursuing or distributing taxpayer grants, she has taken her show to London. I can’t detect a brutal silencing campaign. She has another climate-horror dance involving fixing herself painfully to a 500kg block of melting ice (the Antarctic isn’t melting, but never mind). She cries and wails, to the distress of pal Bec Dean. Well, I have great news for Latai Taumoepeau. Seas are not drowning Pacific islands after all. The most low-lying of them, Tuvalu, continues growing in size, according to a new peer-reviewed paper in Nature Communications by University of Auckland scientists. Using aerial photos and satellite imagery, they found that, from 1971-2014, eight of the nine atolls and nearly three-quarters of the 101 reef islands grew in extent rather than eroded. Tuvalu gained 73 hectares or 2.9%. Of the 101 islands, 73 have grown. After backside-saving kow-tows to climate orthodoxy, the paper says the Tuvalu islanders should skip their doomsday caterwauling and hopes for antipodean visas, and instead “start planning for a long-term future”. Co-author Paul Kench says that since Tuvalu land is expanding, there’s decades for the islanders to work out adaptation plans. “Loss of land is unlikely to be a factor in forcing depopulation of Tuvalu,” he concludes. It’s been established for years that Tuvalu is growing, but this evidence has been ignored both by the Pacific islanders (who have used ‘international compensation’ for global warming as a money machine), and by all the green propaganda groups which use “drowning islands” as persuaders of the ignorant. Indeed my first contribution to Quadrant Online six years ago dealt with an earlier study by the same Auckland Professor Paul Kench, who had used wartime aerial pics to show Tuvalu was growing and had nothing to worry about for the next 100 years. As he said this, his eyes again filled with tears, and mortified delegates applauded him wildly. Later, some nark noticed that he was not from Tuvalu at all, in fact he was a lawyer from Queanbeyan, Canberra’s next-door neighbour. He’s an ex-Greenpeace liaison officer and a specialist in island-nation advocacy. At the 2015 Paris climate farce, Tuvalu’s Prime Minister Enele Sopoaga said, “Tuvalu’s future at current warming is already bleak. Any further temperature increase will spell the total demise of Tuvalu.” For the sake of Tuvalu (pop 10,000) he wanted the whole world (pop 7.6 billion) to eschew fossil fuels in the phantasmagoric hope of capping warming at 1.5deg. Climate huckster Al Gore in his Inconvenient Truth movie fictionalised that “the citizens of these Pacific nations have all had to evacuate to New Zealand.” A UK High Court judge Michael Burton, stating the bleeding obvious, said Gore’s claim was false. Gore has never amended his film, which has since been force-fed to millions of Australian schoolchildren. Undaunted by such strictures from the UK Bench (there were eight other errors judicially noted), Melbourne University chancellor Allen Myers AC QC last July awarded Gore an honorary doctorate – in Laws, would you believe. Australian taxpayer aid to Tuvalu for the three years to 2017-18 is $24 million, not bad for an island population of a mere 10,100. DFAT mentions the island’s economic problems and adds, “Climate change impacts will exacerbate these development challenges.” However this “climate change” aid is nothing more than normal development, such as augmenting fresh water, food security and cyclone recovery. Apparently bureaucrats have to keep saying “climate change” to please Julie Bishop and Malcolm Turnbull. So far the number of climate refugee claims from the Pacific amount to 17. The successful ones: zero. This compares with the UN forecasting 50 million globally by 2010. The Wikipedia page Climate Change in Tuvalu has already updated to include the Auckland land-growth results in its opening paragraph. I suspect the warmist vigilantes who censor Wikipedia will find a way to smother and erase that good news shortly. I see in Proceedings of the National Academy of Sciences that if the rate of sea level rise remains constant, we are looking at a rise of 60cm by 2100. I have no idea if this is accurate, but if so and she fears being swamped, Ms Taumoepeau must be very vertically challenged, which may exacerbate her sense of otherisation, poor thing. Moreover, if she fears that the bones of her ancestors will be washed away by 60cm of sea level rise, I conclude they must be buried in a beach. All said and done it’s no wonder that she “throws herself repeatedly on the floor – whether in frustration or despair, it is hard to tell”. Not sure why we should pay for her to do so though. You really aren’t keeping up are you? In the meantime, go to the Gulag and do not collect any climate, victim, ethnic or taxpayer funded grants along the way. Reality is whatever you perceive it to be, not what your lying eyes or senses tell you. So, if it is snowing, that is global warming; if there is another ho-hum hurricane, that is climate disruption; if their is a orought or rain that is an omen the world is ending; if there is a king tide, that is rising sea-levels (for the next 2-hours anyway). Ge with the program! Claim your entitlements while chanting that you want to see Oz burn to the ground. Alice undderstood our modern world very well (though it is reputed she was hallucinating on magic mushrooms). Some months ago I attended a truly bizarre meeting of genuine Klimate Kult Katastrophists (KKK for short) who really, REALLY did believe they were right in advocating the destruction of Oz to save the planet. It was a parallel, echo-chamber universe of fired-up (non-CO2 producing millennials). Sovereignty, nations, economics, culture were all alien to them. As the words of ‘Ghost Riders in the Sky’ go: “Their hooves were made of steel and their horns were made of fire ….”. ISIS had nothing on these irredemiables of a lost generation. And so the disenlightenment proceeds – multiple lunacies, imputed guilts, force-fitted hairshirts, self-appointed high priests haranguing the populace daily. Medieval priests were confounded by the translations from Latin to common languages. Modern high priests keep sacred scriptures from the gaze of the hoi-polloi with expensive paywalls, ensuring widespread ignorance and thus malleability.